Brady Corporation's new PaintStripe Floor Marking Stencils are designed to help create precise, painted lines to quickly organise workplaces and increase their efficiency. Clear visuals, like safety signs and floor marking, can communicate important information exactly where the information is needed. They help create an efficient, lean workplace by supporting employees to quickly and easily recognise safe walking areas, forklift lanes, storage locations and specific production areas. Marking floors can offer great benefits, but painting a precise line on a factory floor can be quite time consuming. With Brady's PaintStripe Floor Marking Stencil, precise lines can be painted a lot faster. Distance markings on the stencils enable users to exactly map out entire floor lines or areas before applying paint. 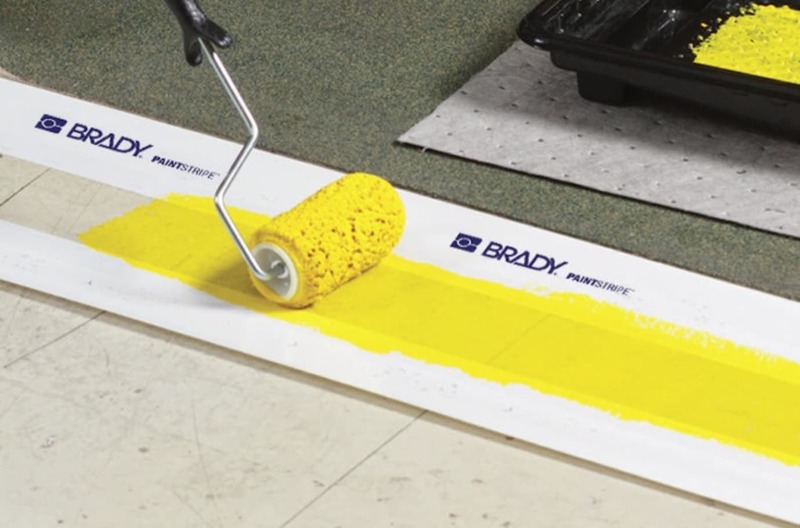 Equipped with Brady adhesives, the PaintStripe stencil can quickly and securely mask floor line edges and is easy to remove at the same time in order to achieve precise floor markings. Accelerating the application of painted floor marking like this, minimises project preparation time and disruption of normal operations. Brady's PaintStripe is available with two adhesive types to suit a range of floor surface types. Painted floor marking using PaintStripe stencils is ideal to increase efficiency in outdoor applications and also on high traffic factory floors, in heavy manufacturing facilities, in facilities with wet floors, harsh washdown or floor cleaning protocols and on floors frequently exposed to chemicals. Make sure you use paint suited for your working context! Discover how easy it is to paint precise lines to increase workplace efficiency with PaintStripe Floor Marking Stencils and receive a sample.